"Guiding Principles for Sales Transformations"
Sales Transformation enables company executives to improve sales performance by aligning the resources that relates to sales, management, marketing and customer service, or improving sales talent and sales operations. 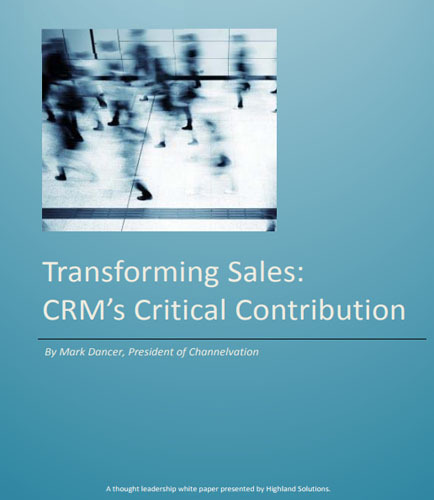 This informative white paper on Transforming Sales: CRM's Critical Contribution discusses the guiding principles for sales transformations and the impact of CRM on the sales organization. What are the key decision factors for choosing the right partner for your sales transformation initiative? What are the important elements of a sales transformation that the sales teams must get right? What are the components that ensure the sales transformation initiative is relevant? Thinking ahead, what is your company’s change management strategy to achieve the required sales transformation? Download this informative whitepaper to read more .